High and rising income inequality in the United States has recently been widely commented upon. What has not been as widely discussed is the role educational attainment has played in these disparities. Indeed, America is in some ways two different countries economically, segregated by educational achievement. However, this is not just an income effect. 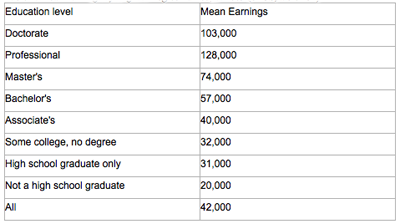 Table 2 demonstrates that US unemployment rates and educational attainment are also strongly related to each other. The better educated the group, the lower the unemployment rate -- and this striking result is consistent over a ten-year period and is highly significant. These figures strongly suggest weak demand in our economy -- over a long period -- for less educated workers, and greater demand for more educated workers. Even assuming an imperfect labor market, this indicates rising wages for workers in demand (high educational attainment), and weak-to-flat wages for workers not in demand (low educational attainment). 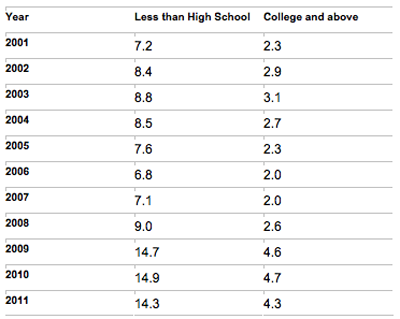 At the extremes, if you have less than a high school education, you've spent the last 10 years in a recession -- with the lowest unemployment rate being 7%, and the highest reaching 15%. If you have a four-year college degree and at least some graduate school, recessions have been mild -- with current unemployment rates of 4.5%, compared to an overall rate of 9%. In many ways, our two economies have created two separate societies. Those with low educational attainment drift permanently between recessions and depressions, with little stability. Those with high educational attainment experience increased wealth, only mild recessions, and interesting projects with personal growth. Additionally, these numbers suggest that our lack of highly-skilled knowledge workers is a major binding constraint on the growth of the American economy. In 2006 and 2007, unemployment rates for the highly-skilled group were as low as 2% -- a figure viewed as basically beyond full employment. These results also imply that further economic growth in 2007 would have resulted in even higher wages (and more income inequality) for the more highly educated group. Interestingly, it appears that high school students are already reacting to these price signals from the market. In 2000, 63% of high school completers enrolled in college. By 2009, this number approached 70% (SAUS, Table 276). Finding employment for older workers with limited educational attainment may be challenging. A significant number of people may prematurely withdraw permanently from the labor force. The next cyclical economic upswing will likely again see shortages of highly-skilled workers. Visa reform allowing increased importation (or retention) of 'top talent' would greatly benefit our economy, by reducing a major constraint on economic growth. Most flat tax proposals appear to only increase income inequality (by lowering taxes for higher income groups) without addressing the structural unemployment issues. With due respect to our presidential hopefuls -- flat taxes, regulatory reform and fiscal austerity don't address a major cause underlying income inequality and unemployment. Instead, their proposals might just make things worse. Notes: All amounts are in real terms; SAUS (Statistical Abstract of the United States) published by the US Census Bureau. Steven Strauss was founding Managing Director of the Center for Economic Transformation at the New York City Economic Development Corporation. He will be an Advanced Leadership Fellow at Harvard University for 2011-2012. He has a Ph.D. in Management from Yale University. Follow him on Twitter @steven_strauss.